"Lo que más he valorado es la rapidez en el envío ya que justo después de..."
Round beads of silk stone for mounting jewelery. The name silk stone is a commercial term for this beautiful natural stone with gray tones with black streaks similar to silk threads. Available in various sizes of perforated round bears arranged in strips approximately 40 cm. String of Red Jasper beads, 6mm ball size. Measurements: Each string is 40 cm long and weighs 20 grams and contains 65 balls, red jasper, size 6 mm ball, approximately. Red Jasper String of 8mm ball size accounts. Measurements: Each string is 40 cm long and weighs 40 grams and contains 48 balls, red jasper, size 8 mm, approximately. String of red jasper 10mm ball size accounts. Measurements: Each string is 40 cm long and weighs 57 grams and contains 39 balls, red jasper, size 10 mm, approximately. 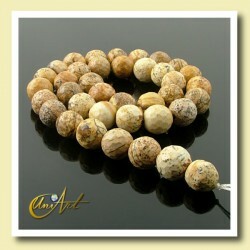 Picture Jasper 6 mm Round faceted Bead. String with about 38 cm in length. 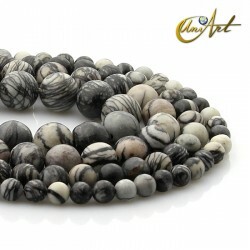 Each strip jasper Paisina weighs approximately 20 grams and contains on average 65 beads 6mm faceted. 8 mm Round faceted Picture Jasper Bead. String with about 38 cm in length. 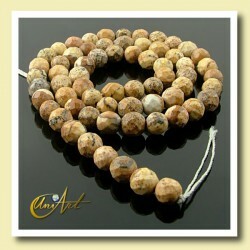 Each string of round faceted picture jasper 8 mm contains 45 beads and weighs 36 gr. approximately. 10 mm Round faceted Picture Jasper Bead. String with about 38 cm in length. 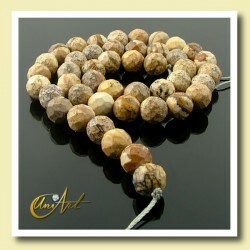 Each string of faceted picture jasper 10 mm size contains 38 beads and weighs 48 gr. approximately. 12 mm Round Beads of Blue African Jasper. String with about 40 cm in length. Each string contains 34 balls and weighs 80 gr. approximately. 10 mm Round Beads of Blue African Jasper String with about 40 cm in length. Each string contains 39 balls and weighs 55 gr. approximately. 8 mm Round Beads of Blue African Jasper. String with about 40 cm in length. Each string contains 49 balls and weighs 36 gr. approximately. 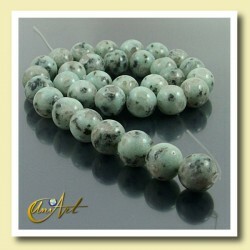 12 mm Round beads of Green Jasper. String with about 40 cm in length. Each string contains 34 balls and weighs 80 gr. approximately. 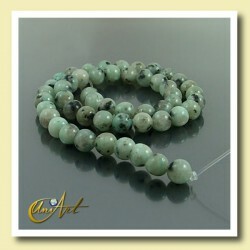 10 mm Round beads of Green Jasper. String with about 40 cm in length. Each string contains 39 balls and weighs 55 gr. approximately. 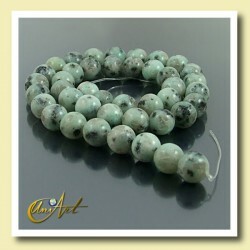 8 mm Round beads of Green Jasper. String with about 40 cm in length. Each string contains 48 balls and weighs 37 gr. approximately. 6 mm Round beads of Green Jasper. 6 mm Round beads of Green Jasper. String with about 40 cm in length. Each string contains 65 balls and weighs 20 gr. approximately. 10 mm Round beads of red sesame jasper. String with about 40 cm in length. Each string contains 39 balls and weighs 55 gr. approximately.